Superpowers community » SUPERPOWERS — HTML5 2D+3D GAME MAKER » Superpowers Discussion · Replied to Liam Brocklehurst in Setting tile impassibility? Can someone show me an example? I could not to make the "right way", the block are not in the same Tile position. Obs: I'm using the Ninja Tileset from superpowers. Tile positions are: 1040,1041,1068,1069, how I make a property with this? Superpowers community » SUPERPOWERS — HTML5 2D+3D GAME MAKER » Tutorials & Guides · Created a new topic [Order] [Help] Bullet/Cast Spell Tutorial? Can anyone help me with some tutorial to cast bullets (Spells, Heals, etc.) from my Player? Maybe all you have to do is put a ELSE conditional to set Zero into X axis when no button is pressed. So, when the key left up, the actor stops. // Set here, inside the else. 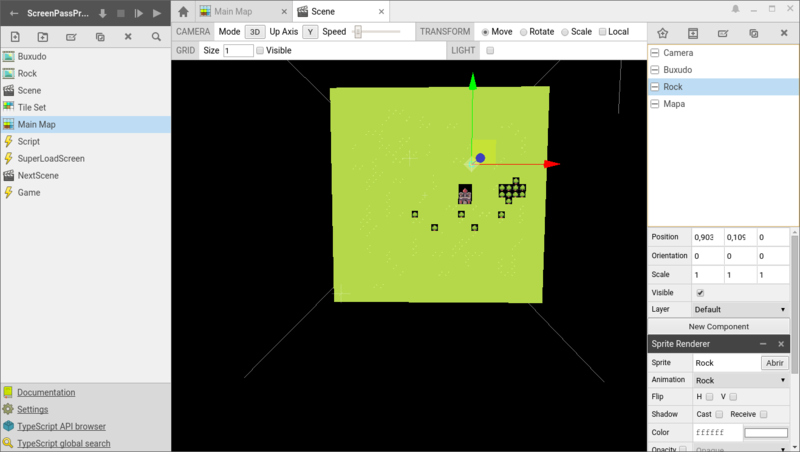 Superpowers community » SUPERPOWERS — HTML5 2D+3D GAME MAKER » Game Scripting & Shaders · Posted in [Script] [SOLVED] How to know what Scene is running? Guys, I create a map, but when I import to scene, he cover the other actors o,o. Why this occurs? How to solve? Superpowers community » SUPERPOWERS — HTML5 2D+3D GAME MAKER » Game Scripting & Shaders · Replied to bilou84 in [Script] [SOLVED] How to know what Scene is running? Superpowers community » SUPERPOWERS — HTML5 2D+3D GAME MAKER » Game Scripting & Shaders · Created a new topic [Script] [SOLVED] How to know what Scene is running? The point is: I want to get the current scene running. Is it Possible? itch.io Community » General » General Discussion · Created a new topic [Script] [Help] How to know what Scene is running? I cannot open the game in ubuntu 15.04. Need run some command before?